If you have lived in the Metro DC area for very long, you have probably heard of Bayscapes or Bayscaping. In 1992, the Alliance for the Chesapeake Bay, in partnership with the U.S. Fish and Wildlife Service, created the program that is now nationally known as BayScapes. The vision was to create an educated citizenry dedicated to the use of native, non-invasive plants in their landscapes to attract wildlife and reduce the amount of pollutants going into the Chesapeake Bay. There is a ton of information on the Bayscapes website, including information about why, how and where to choose native plants. They even have some great lists of native plants for the Chesapeake Bay area, you just have to hunt around a little bit to find them. But wait! I kept looking and I found this online list of 422 plants that they have created on the Lady Bird Johnson Wildflower website to go along with Bayscapes! Oh joy, joy! 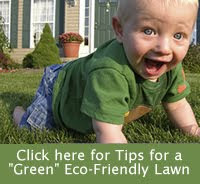 Online, clickable links to 422 Bay friendly plants! And if that isn't exciting enough, it looks like they are in the process of putting their guide, "Native Plants for Wildlife Habitat and Conservation Landscaping: Chesapeake Bay Watershed"(by Britt E. Slattery, Kathryn Reshetiloff and Susan M. Zwicker. 2003, 2005, 2009) online. a design feature that will allow users to create a personal virtual garden is in the works. Although the full version will not be available until 2012, the initial phase should be on the street in late spring or early summer 2011. I just LOVE all the great eco-friendly information that is finding its way online. Kudos to the Alliance for the Chesapeake Bay and the U.S. Fish and Wildlife Service.